Place flour in shallow dish. Add eggplant, 1 slice at a time; turn to evenly coat both sides of each slice with flour. Gently shake eggplant to remove excess flour. Heat 1 Tbsp. oil in large skillet on medium-high heat. Add eggplant, in batches; cook 2 min. on each side or until golden brown on both sides, adding remaining oil to skillet as needed. Drain eggplant on paper towels. Spread 1/4 cup pasta sauce onto bottom of 11x7-inch baking dish sprayed with cooking spray. Cover with layers of 1/3 each of the eggplant and remaining pasta sauce; sprinkle with half of the mozzarella and 1/3 of the Parmesan. Repeat all layers. Top with remaining eggplant, pasta sauce and Parmesan. Bake 25 to 30 min. 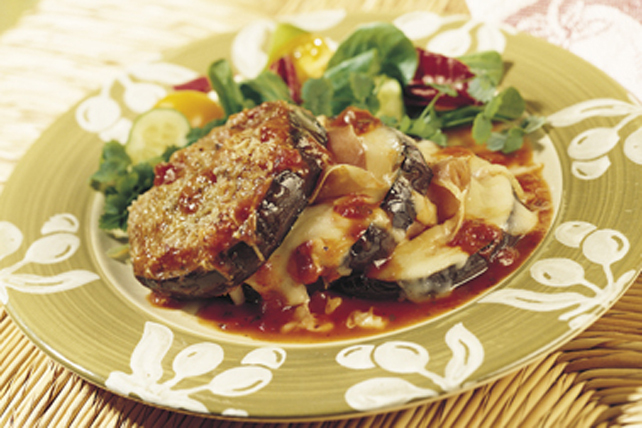 or until eggplant is tender and sauce is hot and bubbly in centre. Let stand 15 min. before cutting to serve.